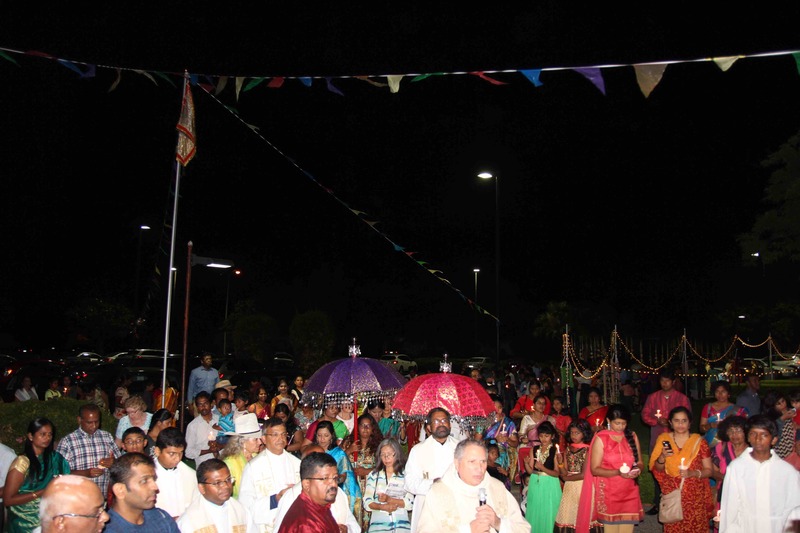 With Happiness showering from Heaven and Praising raising from people, it was a spiritually motivating experience celebrating the fourth-anniversary feast of Our Lady of Velankanni at Church of Resurrection, Sunnyvale, California, on September 10, 2017! The celebration was magnificently successful because of our Mighty God to honor His Immaculate Mother with the help of Angels from Heaven and His aids on earth! 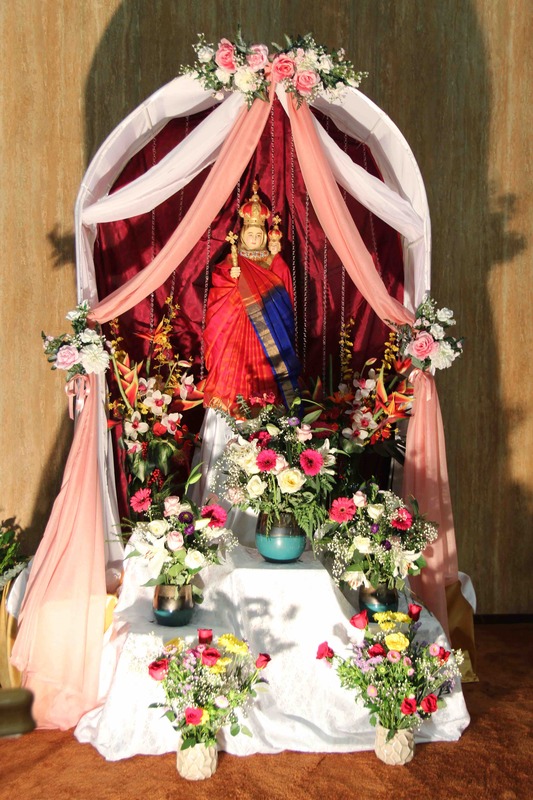 It is a very comforting feeling that the devotion to Our Humble and Miraculous Lady of Good Health is spreading globally, as we witnessed here seeing multiple ethnic communities from near and far places coming together filling-up the "Church of Resurrection" with their huge presence (more than four hundred by some meaningful estimation) to honor Our Holy Mother on the feast day. While we honor Our Lady of Good Health and submit our petitions to her, our loving Mother Mary also has this kind request to all of us: "Whatever He says to you, do it" (John 2:5). Listening to our Holy Mother will make us experience the miracles like the First Miracle by our Lord Jesus satisfying His Mother’s wish to help others. The organizers, volunteers, and contributors sincerely THANK all who came to celebrate Our Lady of Velankanni feast with us and receive blessings from our Mother Mary, and we WELCOME you all again to take part in all our future spiritual and cultural events so we all grow in faith together while at the same time enjoying our cultural uniqueness. First and foremost, we Thank God, for making this feast celebrating His Mother a very successful event! The name "Vicar General Rev Msgr. Francis V. Cilia" has now become a household name within our community as he has been kind enough to lead the celebration from the beginning until now, and our community whole heartedly Thank him for being part of our community’s this important celebration every year and supporting our community all these years! As our community is part of ‘Church of Resurrection, Sunnyvale", we are grateful to the parish pastor, Rev. Fr. Noel Sanvicente, and the parish community for not only supporting us and providing us with wonderful facilities for the celebration but also being part of our celebration. We were delighted when Rev.Fr. 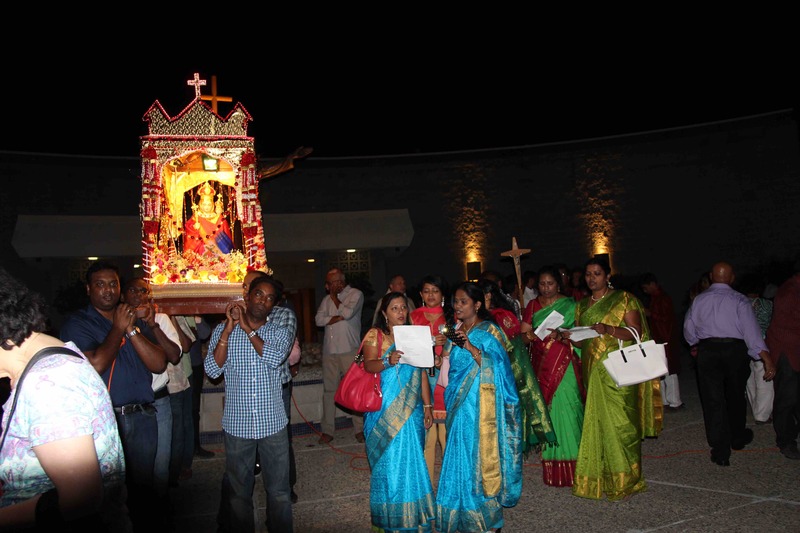 Noel thanked our community for bringing Our Lady of Velankanni to the Church of Resurrection! We also Thank Mary-Claire, Rick, Jose, and Tom from the parish of Church of Resurrection as they were always ready and willing to help with all our needs. We Thank all Rev. Fathers, who represented different parts of India, who eagerly came and joined Vicar General in celebrating Holy Mass for the feast, and they include: Our community’s Spiritual Guru Rev. Fr. Louis Levil, Rev. Fr. Devassia Thomas SJ from Kerala, Rev. Fr. FrancisFendandez from Bangalore, Rev.Fr. Lawry Trinidad SJ from Goa, and Rev.Fr. Leander Xalxo SJ from Madya Pradesh. It would have been very difficult to achieve what we achieved without the help of selfless hard working volunteers and generous contributors, and we are fortunate that our community has numerous of this kind and every year new volunteers of such kind join our community. For example, Charlie, David G, Samual K, etc. are just to name a few who joined this year and contributing significantly. The great set of volunteers and contributors that we have, do this just to glorify our God, honor our Madha and to show community spirit and support. This is the main reason for the great success in all activities this community undertaking. We wish and pray that this level of great community spirit continues well into the future for the continued success going forward to the glory of our mighty God! • The leaders of our community who organized this event by working-out all the fine detail and successfully executing on the plan. • The decoration team for an outstanding job for the feast this year! Our resident decoration experts had the opportunity to work with the award winning designer "Carol Fernandez". The highlight this year was Madha statue was decorated very beautifully in saree! Thanks to Princy and Pam along with others for this marvelous job! Carol, Jimila, Auxilia and others worked hard in coming up with a beautiful home (stage) at the Altar for our Madha. It was a memorable appearance - beautiful Madha with Baby Jesus in hand on the beautiful stage at Altar! Charlie along with his team (Kavitha, David, and others), came up with the 'Thoranam' plan using palms and executed very well decorating outside the church. 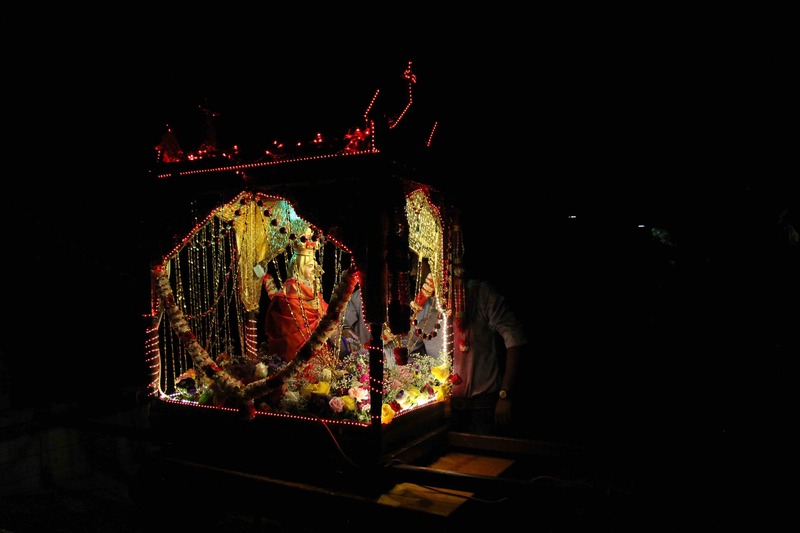 Many contributed decorating the Madha carrier by working with the experts The lighting work for the carrier, by Julian, made our Madha a shining star during the procession. The floor near flag-pole was beautifully decorated with Rangoli by Kavitha, Nimmy, Helen, and Maria. • Outstanding performance by our choir team for the feast and the team worked under the guidance of the famed musical pro, Mr. Sindhuraj Ambros! • Dedicated Altar servers, who are the angels at Altar helping Fathers! • The audio system was clearly sounding – Thanks to Alex Luke, who went above and beyond and made sure the speakers are ready and ensured the audibility stays the same throughout the procession. • Photography -- Our sincere gratitude to Alex Rayan & Mithun, for helping to capture the festive moments and people in the celebration. • Gifts and the shawls for the priests were arranged by Kavitha R, and also memento and gift to the music pro Mr. Sindhuraj Ambrose was arranged by our choir team. • Dinner on the feast day was sponsored by the families of Prabahar, Christina, Lourduraj, Benjamin, and Shyam, Food service was handled by Eugene and Samy with the help from others. • The dedicated volunteers, who are hidden gems of the community, who helped with whatever way possible to make the feast a great success. These are some of the things they helped with: Setting-up for flag-hoisting (setup flag-pole, decorate the place for flag-hoisting with flags, mat, flowers, etc. ), renting and transporting lights and tables, setup light for procession and dinner place, setup the place for dinner with tables, chairs and canopies, bringing things from storage and putting things back in storage, helping with various things during procession (generator, wire, traffic control, etc. ), taking things apart after the event, stay at the end to clean up. Some volunteers helped even when they are not physically available – for example, Dinesh helped with flyer design while in India. Julian and Jimila did shopping for decoration materials for the feast while vacationing in India. • Donors who contributed various ways to help with the celebration and this includes generous donations, decoration materials, gifts/shawls for priests, flowers, lights & dinner tables rental and related transportation, etc. "What made the day more meaningful, prayerful, and successful was your tremendous generosity of time, energy, money, and hard-work. The priests who came to the celebration were impressed about our celebration. Congrats to everyone. May our Mother of Velankanni bless you and your families. May She reward your every effort. My sincere thanks, appreciation, and prayers." Many volunteers assembled in the evening prior to the flag-hoisting day to do all the arrangement to prepare for the flag-hoisting celebration. 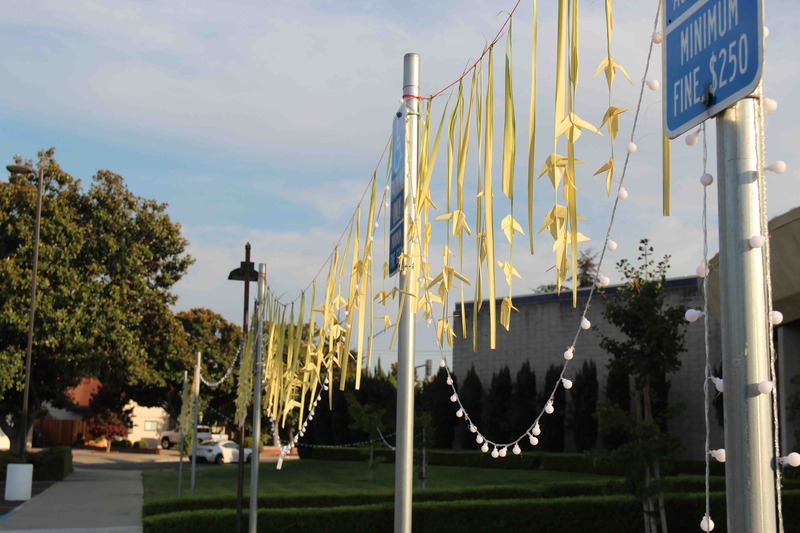 The volunteers erected the flagpole near the Church of Resurrection (same place as previous years) and decorated the nearby places with flowers, flags, light setup to help with flag hoisting and dinner arrangement. 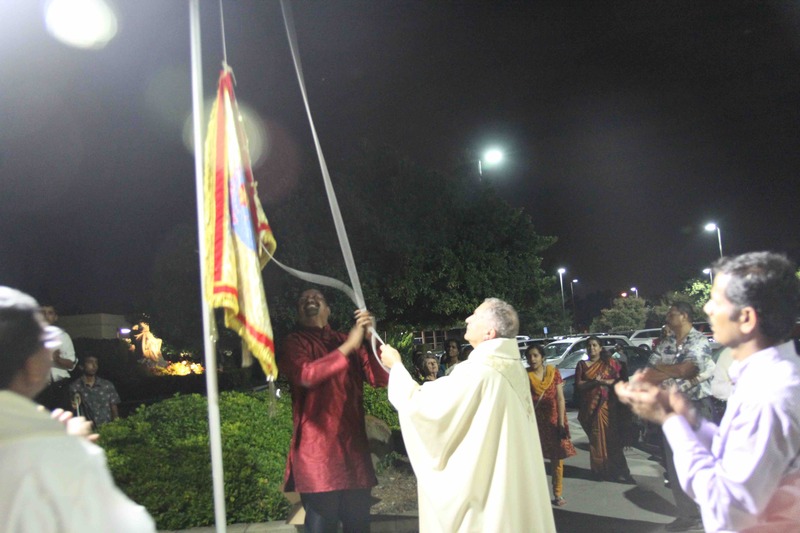 The first-day ceremony started by saying first novena prayer to Our Lady of Velankanni, and followed with Fr, Noel Sanvicente, the pastor of the "Church of Resurrection", hoisting the flag of Our Lady of Velankanni. The bunch of helium-filled balloons were let to fly coinciding with flag-hoisting. 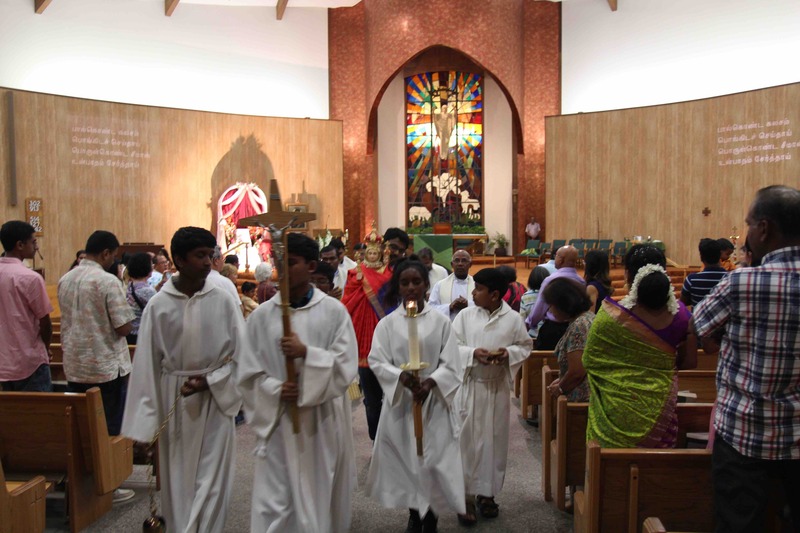 The flag-hoisting ceremony was followed-up with a procession into the church by reciting St. Mary’s prayer & singing devotional songs, and the Holy Mass was celebrated by Rev. Fr. Noel. During flag-hoisting and Holy Mass, Rev. Fr. Noel repeatedly Thanked the community for bringing Our Lady of Velankanni devotion to the Church of Resurrection and also highlighted St. Mary’s special role as Mother of God. It was very good turn-out as many people ventured the historical heat wave (it was around 107 degree Fahrenheit right around the time of flag-hoisting) and attended the flag-hoisting ceremony and the Holy Mass. This first day of celebration was concluded with fellowship, celebrating the birthday for Rev.Fr. Noel and delicious potluck dinner near the area where flag-hoisting took place, and finally volunteers cleaning-up the place. Novena prayer was said remotely through teleconferencing during second day (September 3, 2017) through the eighth day (September 9, 2017). Many volunteers assembled in the evening prior to the feast day to do all the arrangement to prepare for the feast celebration. For some volunteers, their whole families joined to help. The volunteers formed into different teams and each team is assigned to do a specific task. This preparatory effort continued into the next day (feast day) up-to until when the celebration was going to get started. The volunteers completed many tasks during this time and this include: Decorating our adorable Velankanni Madha with saree, decorating the stage for Madha at Altar, decorating the procession carrier, decorating outside church with palm-strings, setting-up lights for the procession, setting-up lights, tables, and canopies at the dinner place, and so on. The feast day started with saying the 9th-day novena and it was followed by Holy Mass. The Holy Mass was attended by a very large number of devotees at the Resurrection Church, an obvious symptom that devotion to Our Lady Velankanni Madha is growing tremendously year after year. 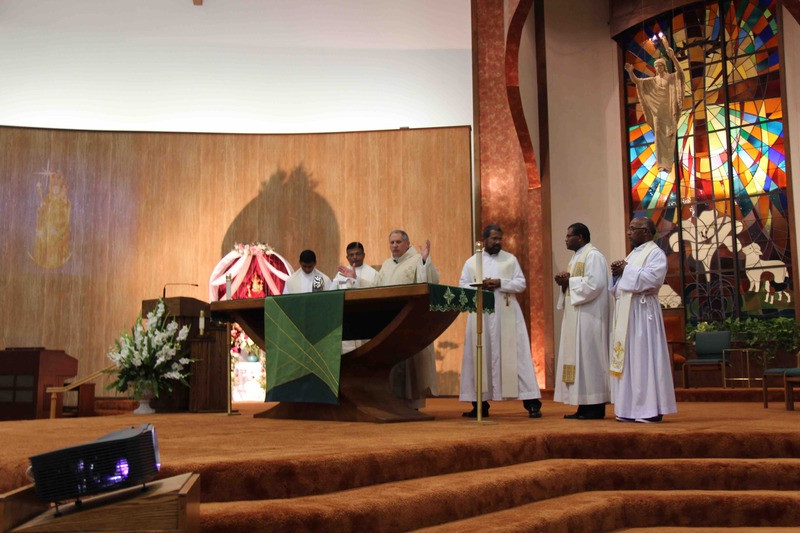 The Holy Mass was celebrated by six Reverent Fathers and they included Vicar General Rev. Msgr. Francis V, Cilia, Rev. Fr. Louis Leveil, Rev. Fr. Devassia Thomas SJ from Kerala, Rev. Fr. Francis Fernandez from Bangalore, Rev.Fr. Lawry Trinidad SJ from Goa, Rev.Fr. Leander Xalxo SJ from Madya Pradesh. The choir was marvelous and immersed all of us with the heart filling devotional songs and music. 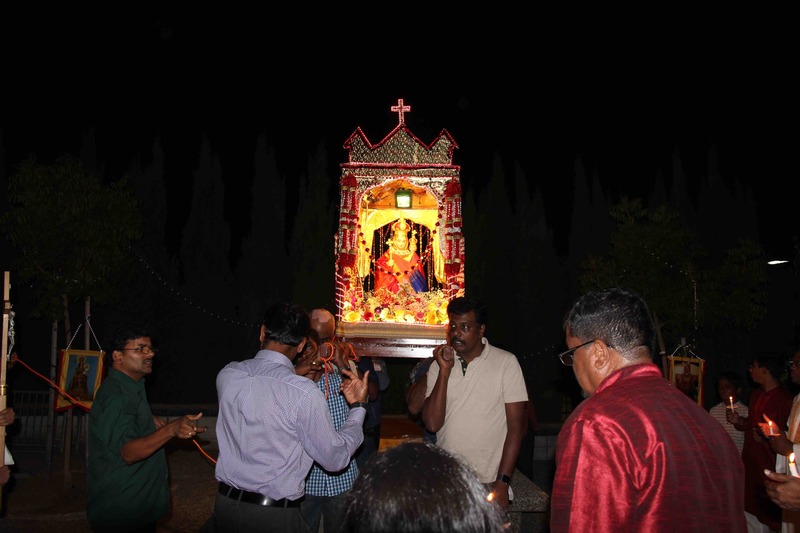 As the Holy Mass was about to begin, Kuthuvilakku was lighted by Vicar General, and Arathi was done to all Fathers. 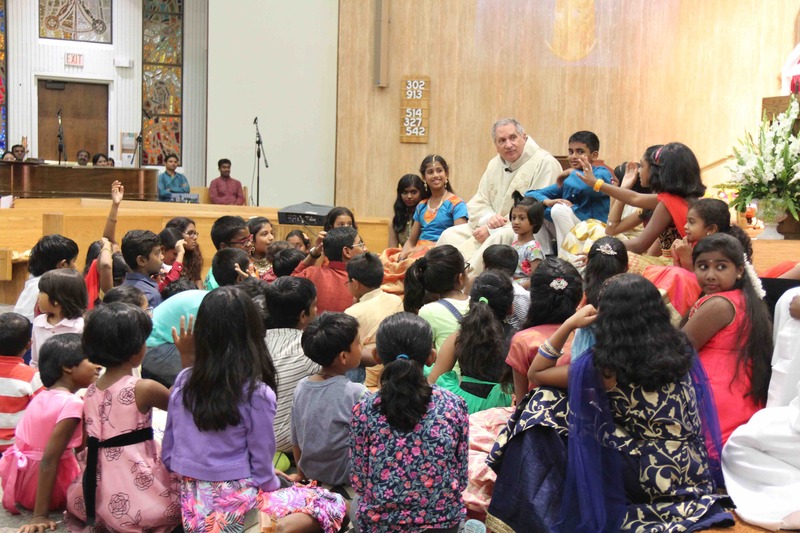 During Homily time, Vicar General invited all kids near the Altar and explored their knowledge on Our Lady of God Health. Mass petitions were read in multiple languages (Tamil, Malayalam, Filipino, Spanish and Hindi). Arathanai was performed by girls with flower, light, and perfume during Eucharistic Prayer time. 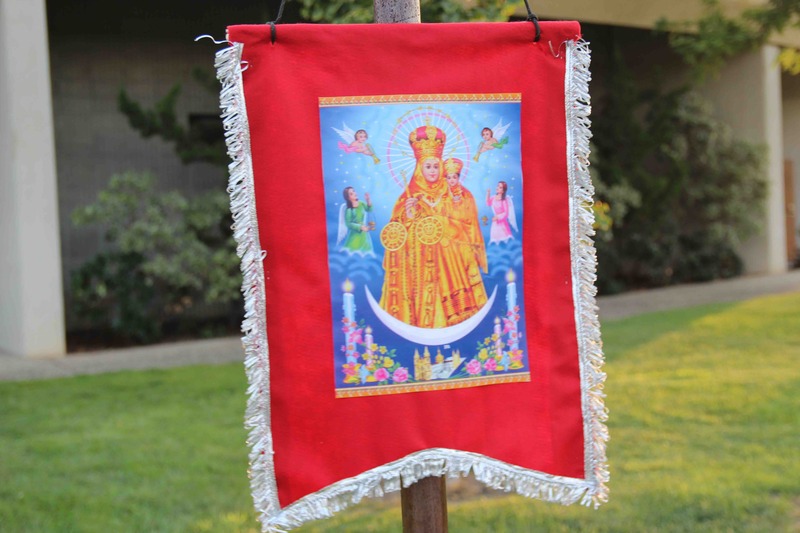 Towards the end of the Holy Mass, fathers were honored with shawls, and gifts. After the Holy Mass was ended, the statue of Mother Mary was carried majestically through the center aisle of the church with Altar Servers escorting and leading the way at the front, and l Fathers following at the back. 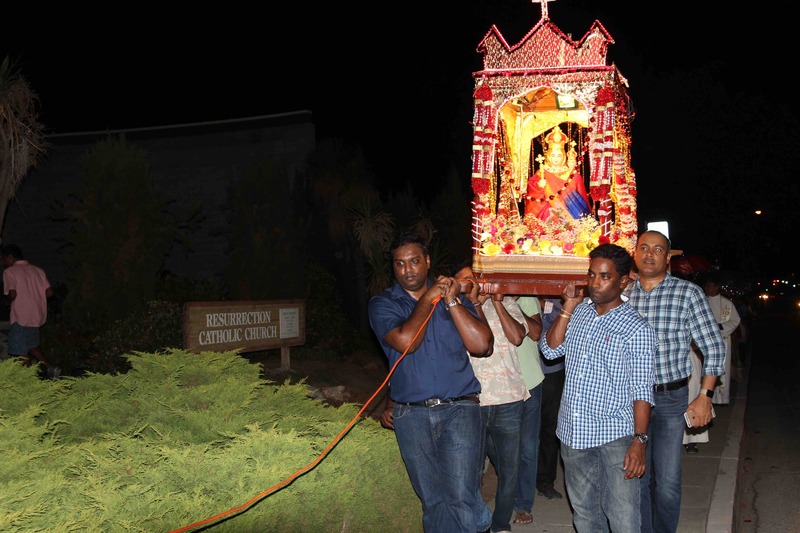 After Vicar General blessed the image of Mother Mary in the carrier, the procession started. During the procession, the devotees recited rosaries and also sang Madha songs. After starting from the side entrance of the church, the procession took the route around the playground field behind the church, exited into the parking lot between church and Farana Center, exited the parking lot (entrance side) moved along the church side of the Stelling Road, and finally entered into Resurrected Jesus place in front of the church. 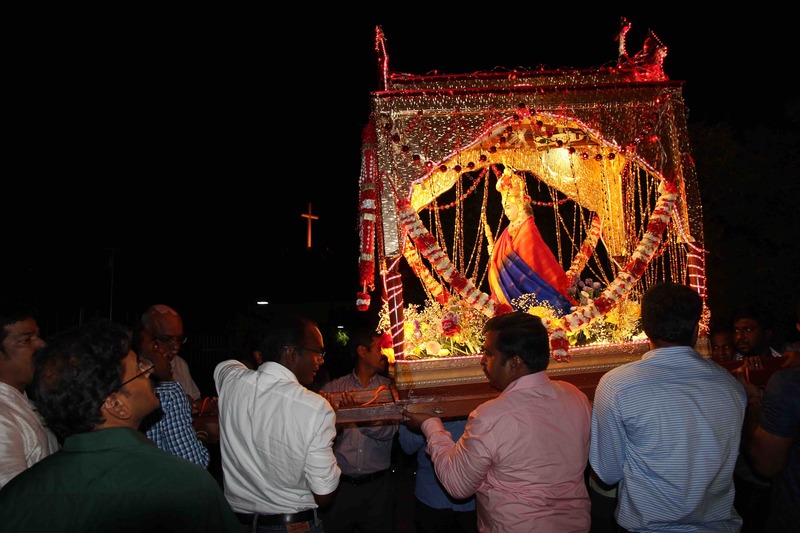 Here, the Madha carrier was positioned in-front of the giant charismatic statue of the Resurrected Jesus and the devotees got the gratification of receiving the blessings from both the Mother and Jesus. As procession was concluded, Fr.Levil offered the final prayer. 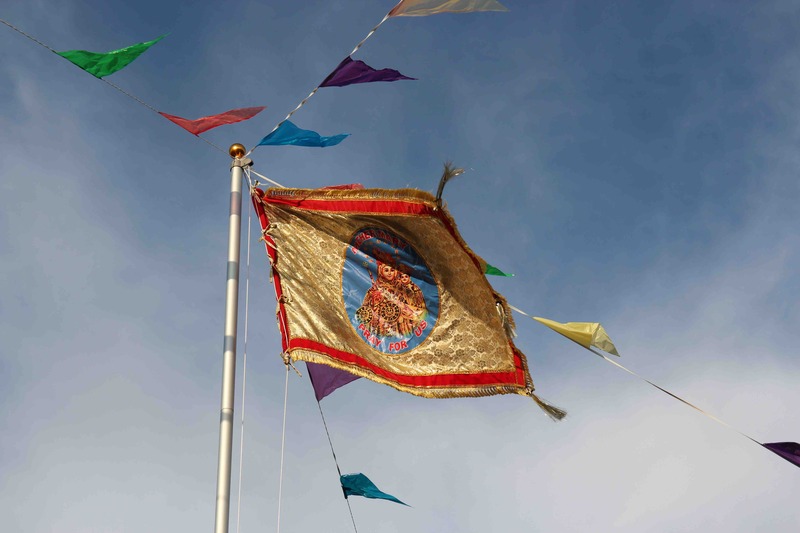 Once the procession is ended, Vicar General helped to lower the flag as an indication that the feast has come to conclusion. Once the flag was lowered, people moved to the area behind the Farana Center where dinner was being served. Everyone appreciated the yummy food. Taking care of huge number who came to the celebration, the food sponsors and organizers arranged for extra food to make sure everyone has enough food. As usual, many volunteers (including their families) stayed back close to midnight to take-apart things, transport them to the proper place, and cleanup. 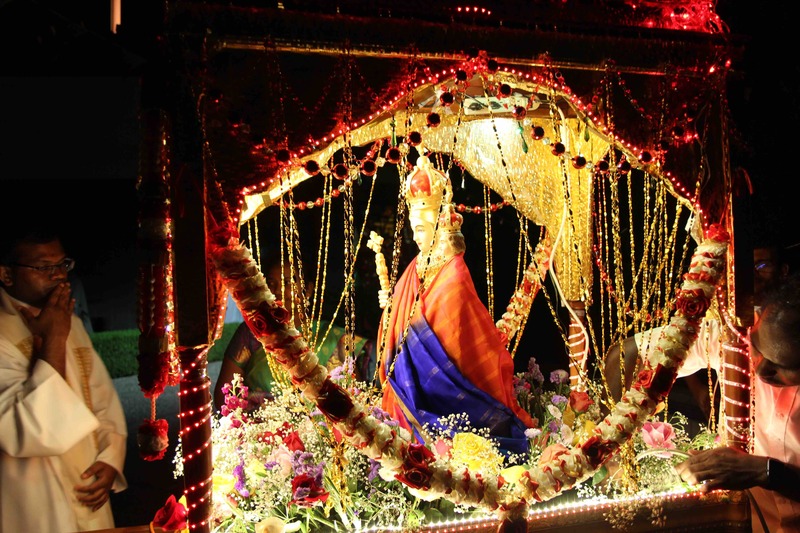 Once again, thank you all for joining us and being part of us in celebrating Our Lady of Velenkanni festival!